The Australian aid program faces a fundamental dilemma: how, in the absence of deep popular support, should it generate the political legitimacy required to safeguard its budget and administering institutions? 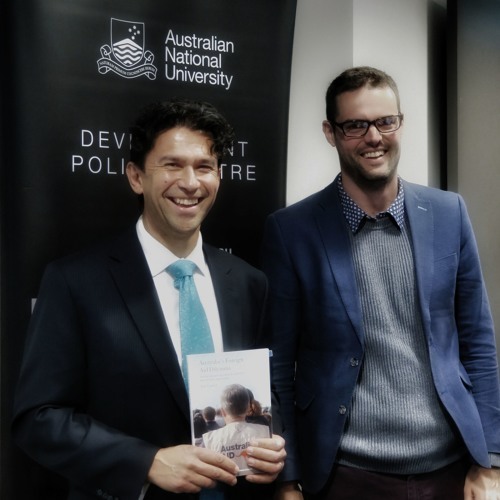 A new book by Jack Corbett entitled 'Australia’s Foreign Aid Dilemma: Humanitarian Aspirations Confront Democratic Legitimacy', tells the story of the actors who have grappled with this question over 40 years. It draws on extensive interviews and archival material to uncover how ‘court politics’ shapes both aid policy and administration. The lesson for scholars and practitioners is that any holistic understanding of the development enterprise must account for the complex relationship between the aid program of individual governments and the domestic political and bureaucratic contexts in which it is embedded. If the way funding is administered shapes development outcomes, then understanding the ‘court politics’ of aid matters. In this podcast and subsequent Q&A of the Canberra book launch, author Jack Corbett discusses the book. Michael Wesley, Professor of International Affairs and Dean of the College of Asia and the Pacific at the Australian National University, provides opening comments and launches the book. Stephen Howes chairs the session. Jack Corbett is Associate Professor of Politics at the University of Southampton, UK; Honorary Associate Professor at The Australian National University’s Coral Bell School of Asia Pacific Affairs; and Adjunct Senior Research Fellow at the Centre for Governance and Public Policy, Griffith University, Australia. He is the author of Being Political Leadership and Democracy in the Pacific Islands (2015, University of Hawaii Press); Australia’s Foreign Aid Dilemma: Humanitarian Aspirations Confront Democratic Legitimacy (2017, Routledge); and with Wouter Veenendaal, Democracy in Small States: Why It Can Persist Against the Odds (forthcoming, Oxford University Press).